A very simple seed to save as it is easy to grow, harvest & clean. Cucumber flowers are insect pollinated, so there is the potential for cross-pollination if more than one variety is grown, however this is easily overcome by hand-pollinating the flowers. While it may be a little more difficult than pumpkin flowers due to the small size of the flower & its delicate nature, the process is basically the same. See 'Hand-Pollinating Pumpkins'. 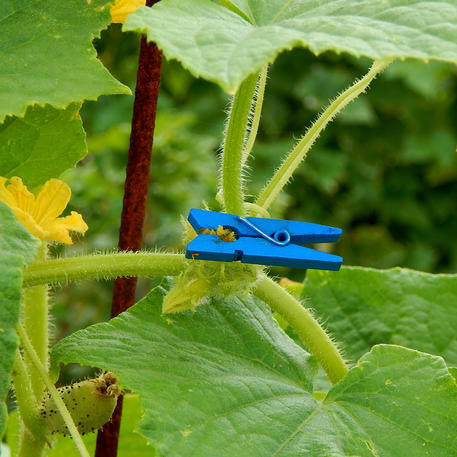 When grown for eating, cucumber plants are usually left to sprawl along the ground, however if you are planning to save seed it is much easier when hand-pollinating the flowers to train them up a trellis. This allows for easier hand pollination with the delicate and tiny flowers easy to access. When to harvest? When harvested for seed, the cucumber should be allowed to become much larger than if the fruitwas harvested for eating. As it reaches maturity, a colour change will occur indicating that the seeds are fully mature and ready for harvest. The colour at maturity will differ depending on whether the variety is black-spined or white-spined. 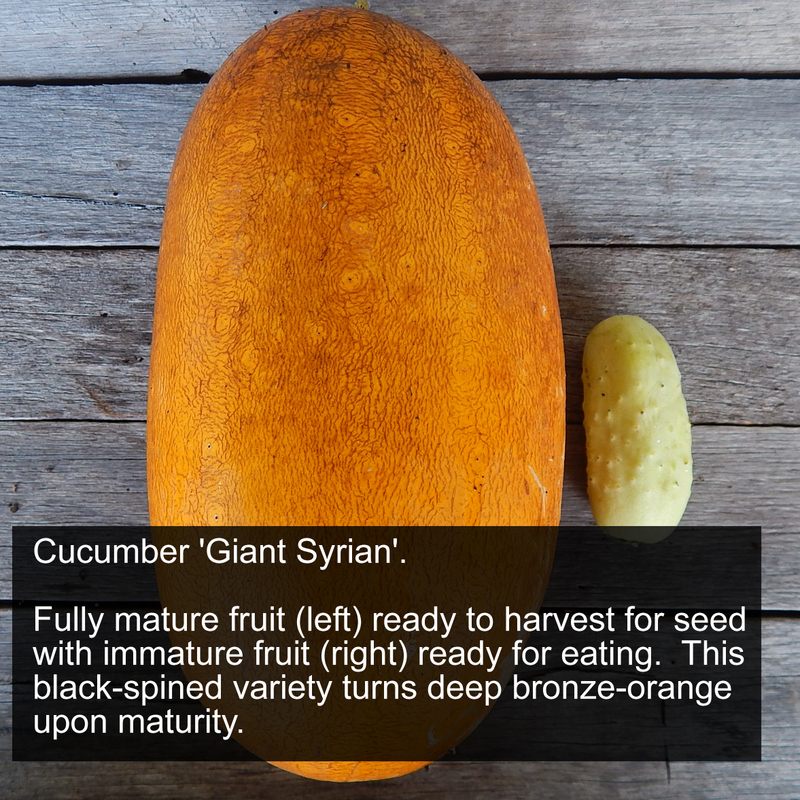 Black-spined cucumbers will turn a deep, bronze-orange colour at maturity while white-spined varieties will become pale yellow. The fruit will also slightly soften. 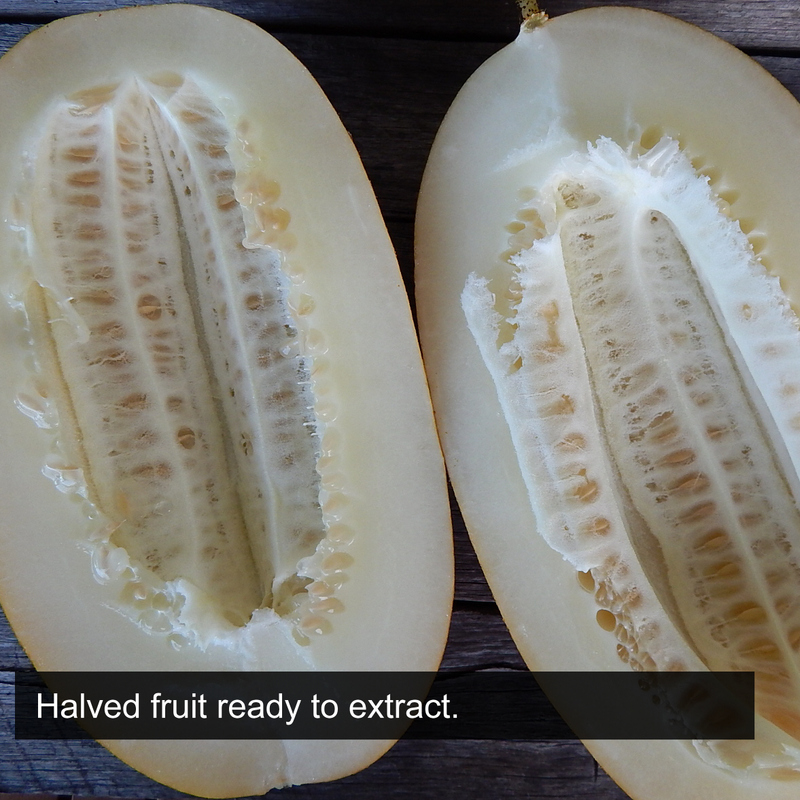 STEP 1: Cut fruit in half and open. 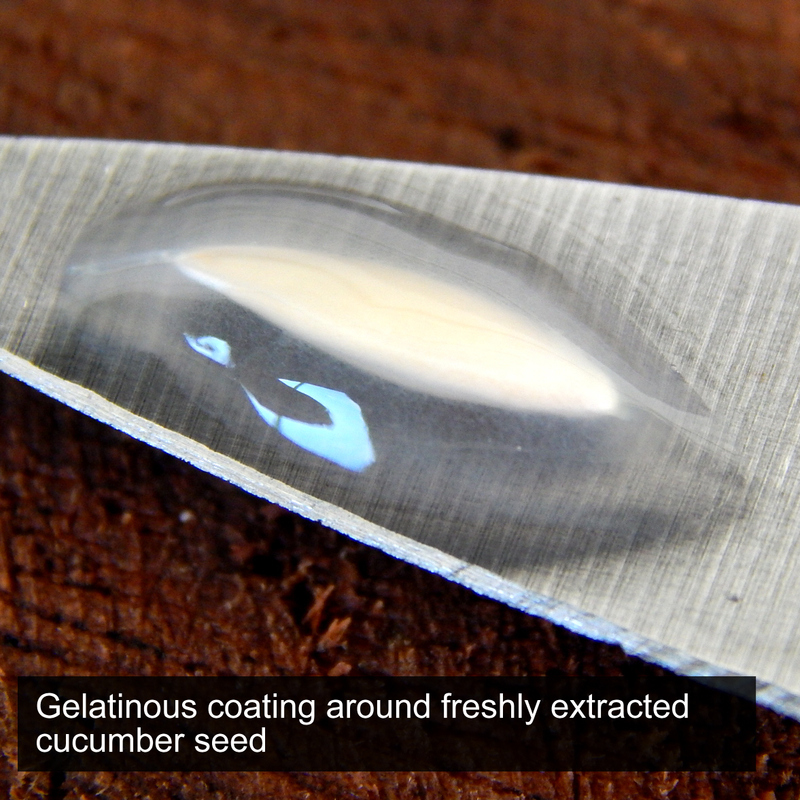 Cutting the cucumber lengthwise allows seeds to be more easily extracted. 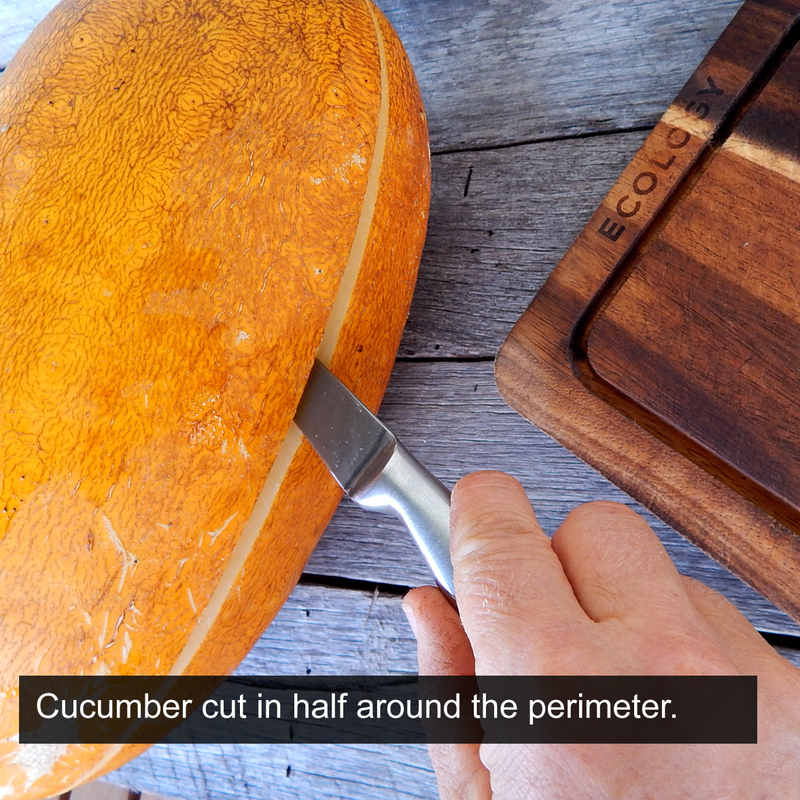 Also it is best to only cut through the flesh going around the perimeter rather than cutting across the whole cucumber at once. This prevents any seeds from becoming damaged. 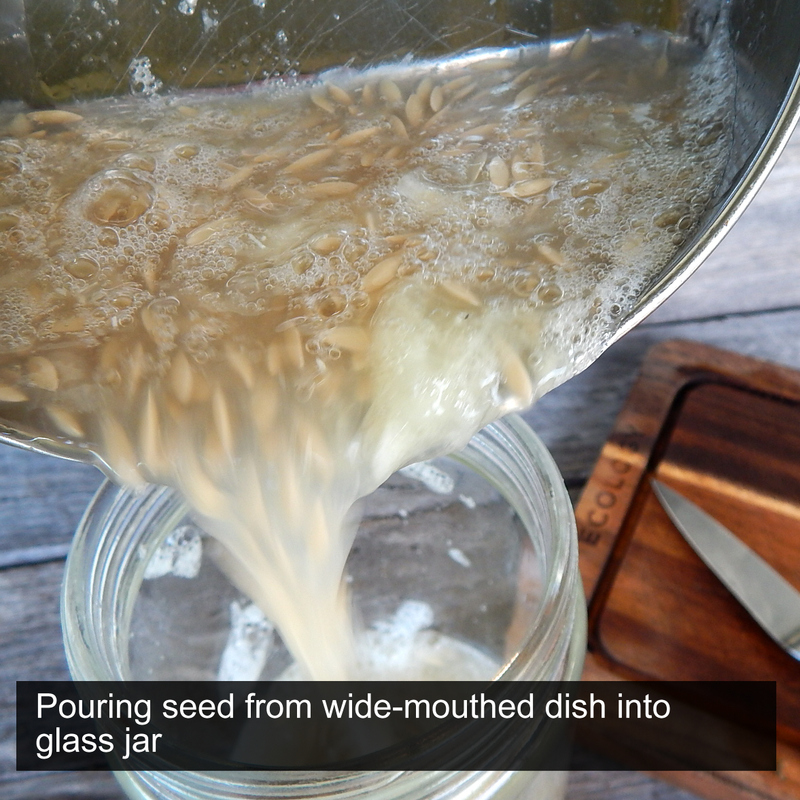 STEP 2: Scoop out seeds and place into glass jar. 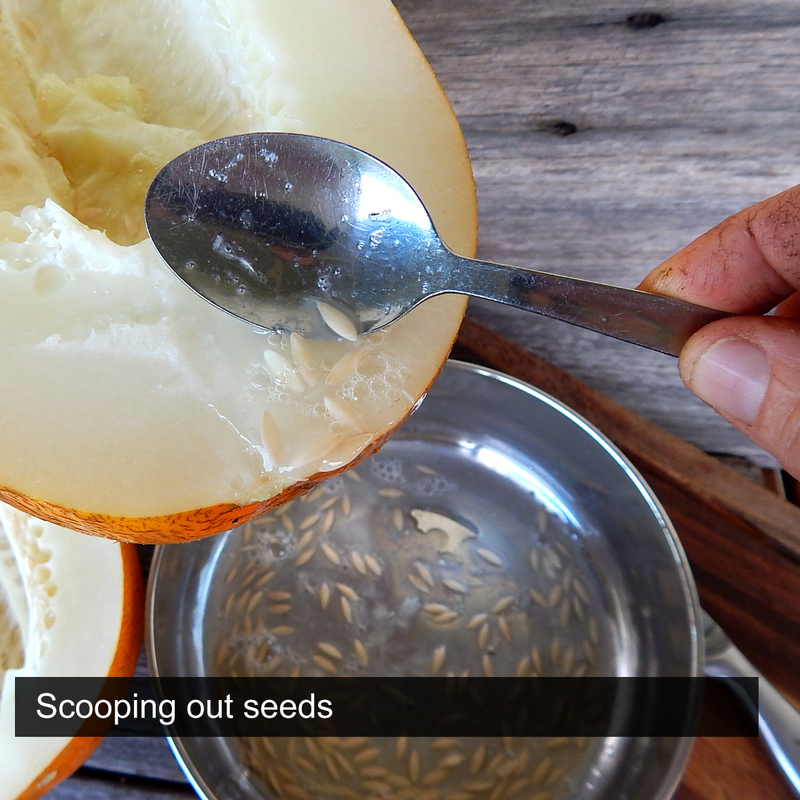 A metal spoon is used to scrape the seeds out of the fruit and into a wide-mouthed dish. This allows easy transfer to the glass jar. Add extra water if needed. 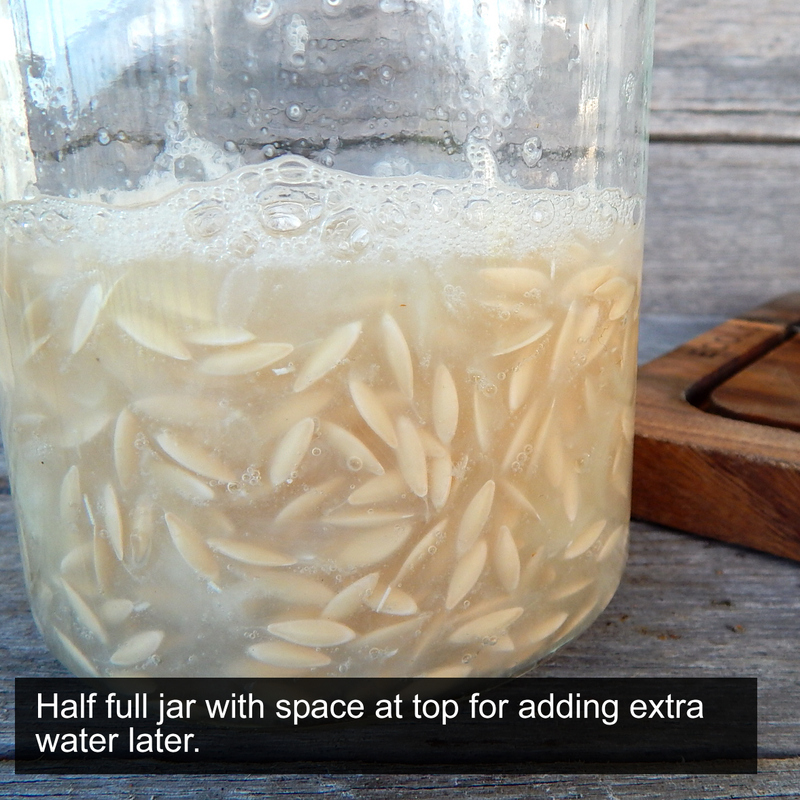 Be sure to leave a lot of room in the top of the glass jar as you will be adding water later on. 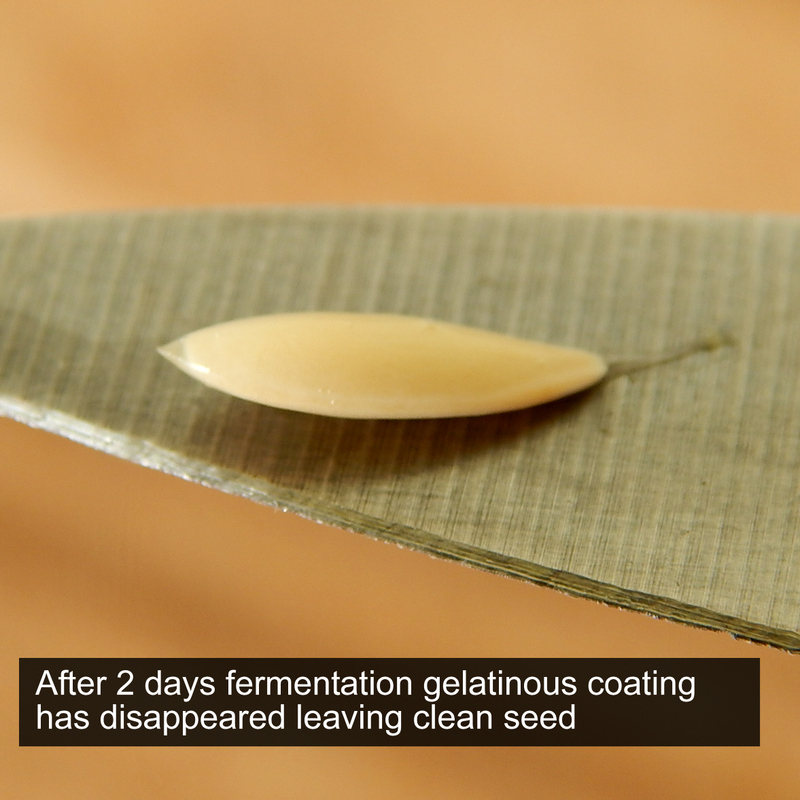 The process is essential as it both removes the gelatinous coating around the seed making it easier to clean and also kills any disease which may be present. The ideal temperature is from 21-27'C. The warmer the weather, the quicker the seed mix will ferment. 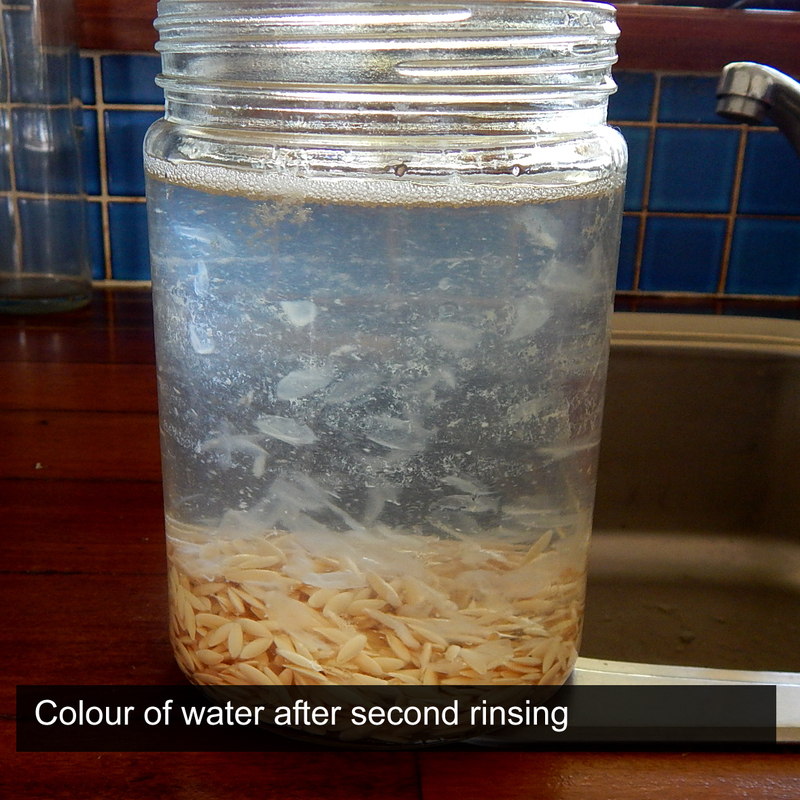 STEP 3: Add water & stir. 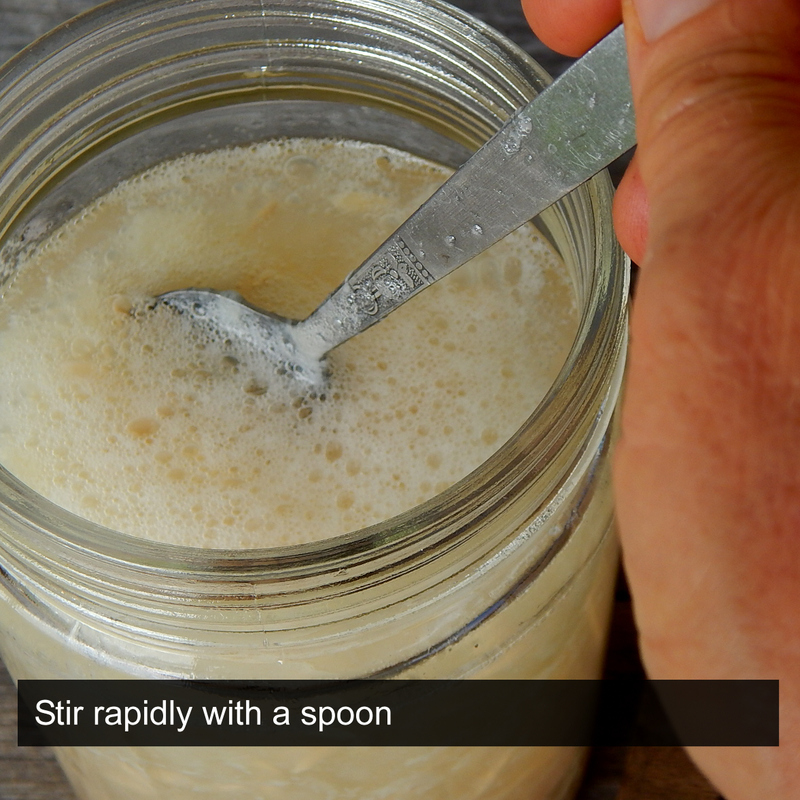 Once the gelatinous coating has been dissolved, add water to near the top of the glass and stir rapidly. 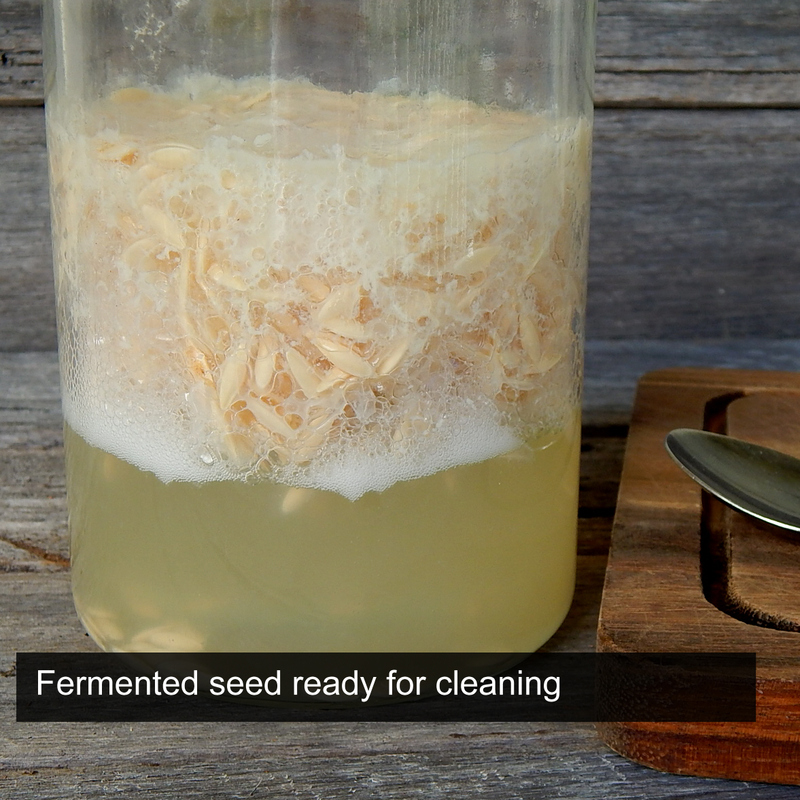 This will clean the seed and separate it from the pulp. 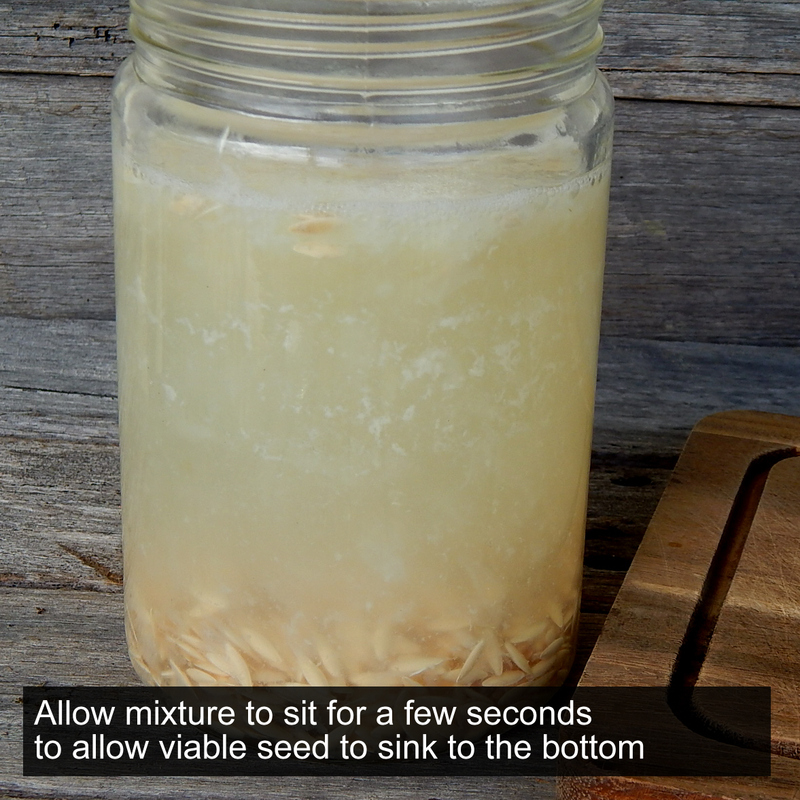 You will notice that the seeds will sink and sit on the bottom of the glass. 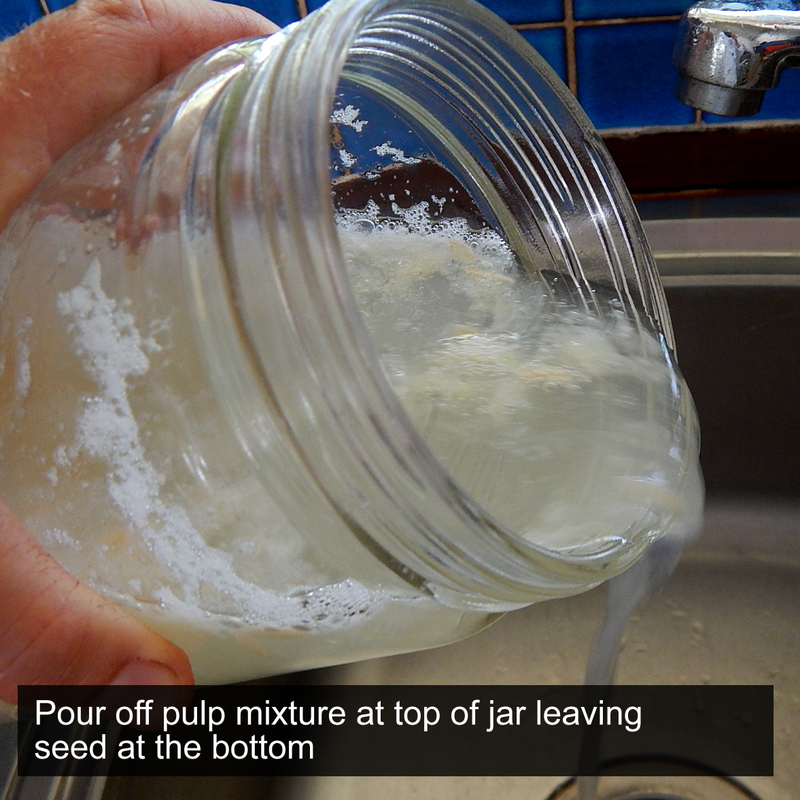 The pulp, placental sacs & any unviable seed will float to the top of the glass. Pour off the top pulp mixture leaving just the seed in the bottom. 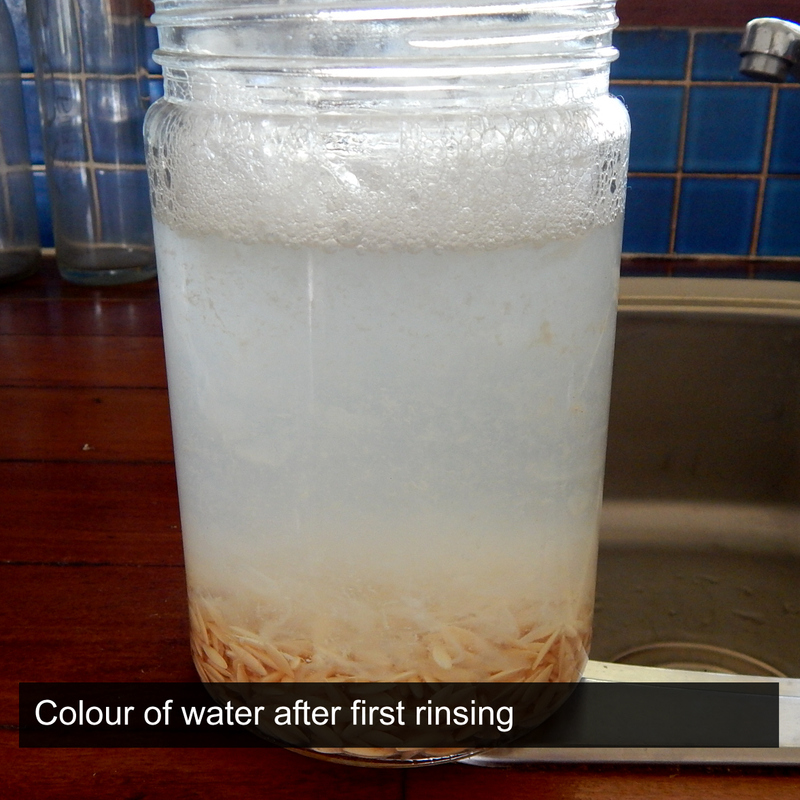 Add more water, rapidly stir & pour off again. 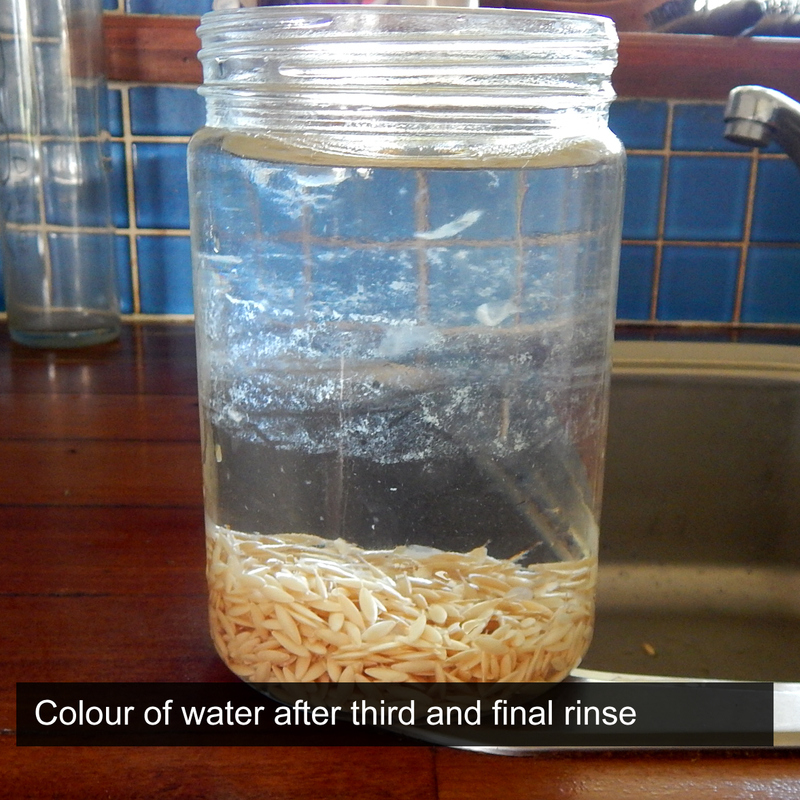 Repeat this process until water is clear & only seed remains in the bottom of the glass. STEP 4: Pour seed into a strainer & rinse. 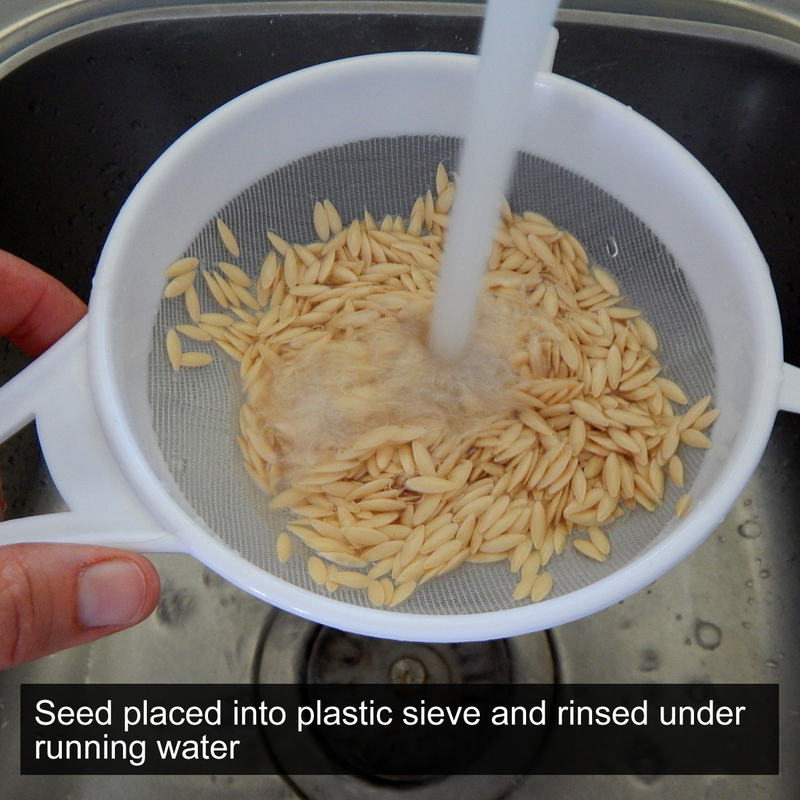 Seed is placed into a plastic strainer & rinsed under running water completing the cleaning process. 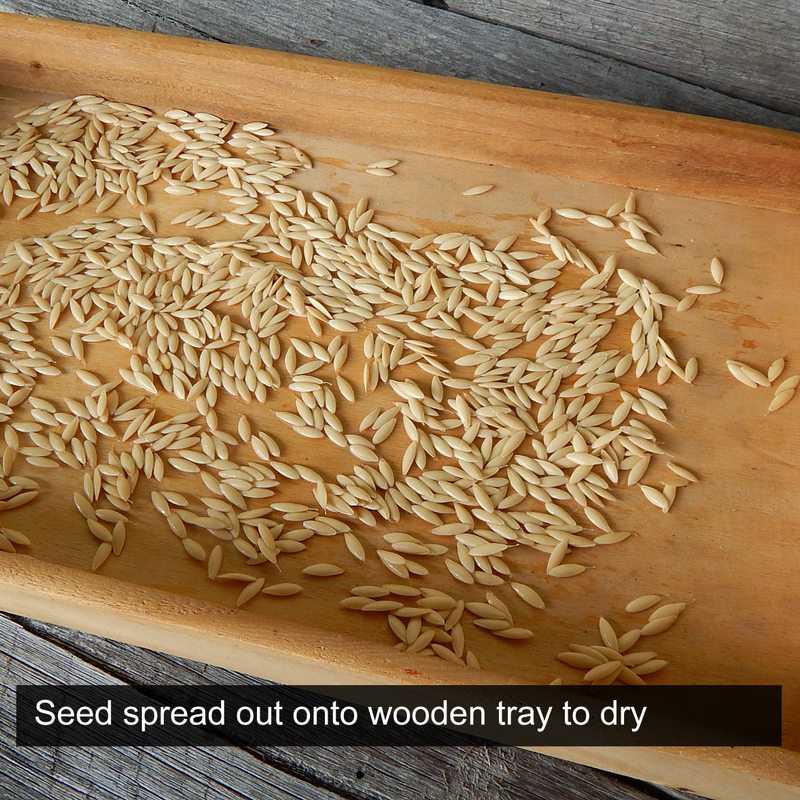 Place seed onto a flat surface & spread out to dry. While we use large wooden trays, you could also use a plate, mesh or something similar. 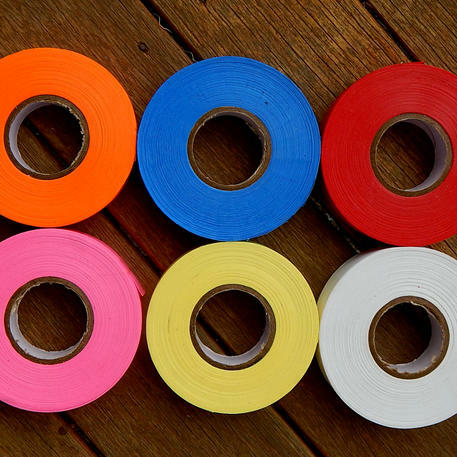 It is best to AVOID paper as seed will stick to it. STEP 5: Allow to sit until completely dry. Seed is left until completely dry. 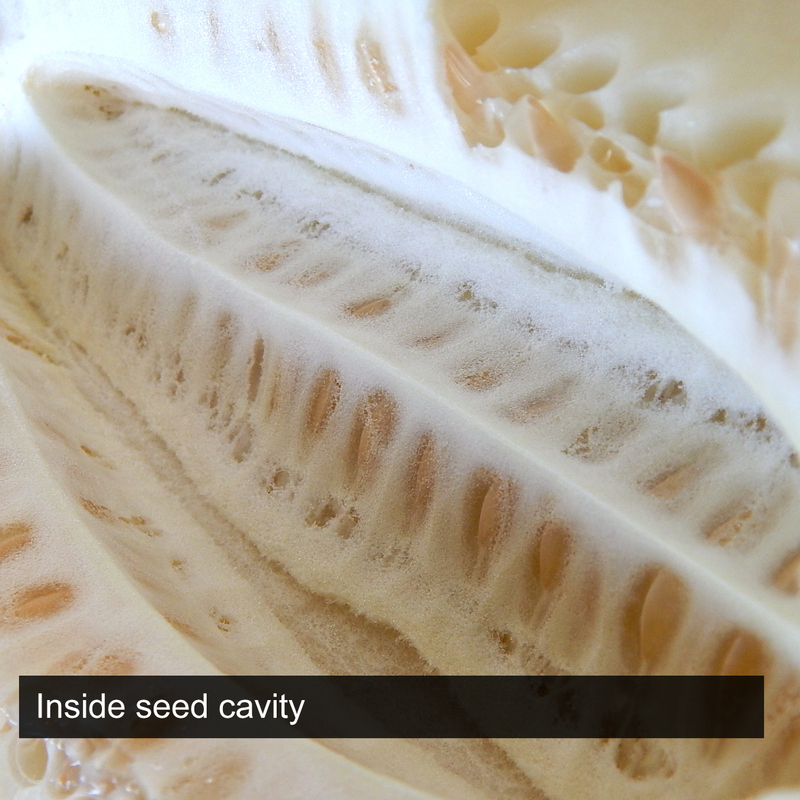 Each day the seed may be broken up using hands to allow even drying & to separate the seed. 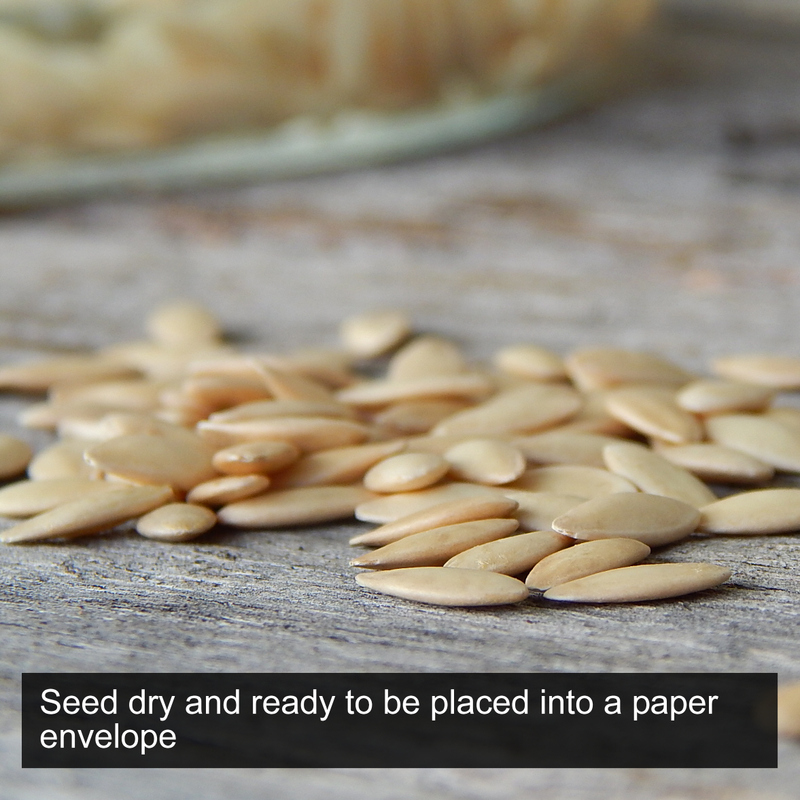 Once completely dry the seed is placed into a paper or glassine envelope & then into a sealed container such as a glass jar. Store in a cool, dry place out of direct sunlight. That's it - job done!